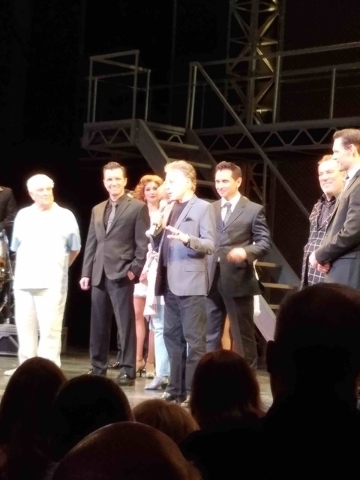 Recap of Jersey Boys Las Vegas Closing from @Robin_Leach in @lvrj with Reflections from @frankievalli! Robin Leach wasn’t exaggerating about how sad it seemed at the JERSEY BOYS Las Vegas closing night performance at Paris Hotel and Casino on Sunday. But…Will JB return to Sin City some day? It seemed so sad at Sunday night’s closing performance of the award-winning musical JERSEY BOYS at Paris Las Vegas after an 8 1/2 year run on the Strip as Broadway’s longest-running production in Las Vegas. The Paris theater was packed, and loyal fans gave the performers one of the longest standing ovations ever. It felt as if JERSEY BOYS shouldn’t have come to a close. And that was the surprise news from Frankie Valli himself and the producers. Frankie told me: “It’s not done yet. There’s still life in this production. I feel as if it will come back sometime in the future. I know it’s going out on the road on tour, but I’m hopeful that we’ll see it back in Las Vegas someday. Click HERE for the full recap.